Since February 2013, we also enjoyed the enrichment provided by including 5 EVS volunteers in our AMURTEL projects. In the kindergartens, Alexandra Tincu, Elisa Poggi and Jana Thenert assisted in the classrooms, learning how to teach the children directly in their native language using stories, songs and yoga. 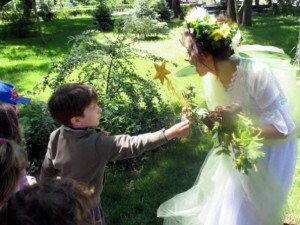 The volunteers were especially involved in our annual Earth Day event and transformed into magical fairies that appear only to children that sing with lots of love in their hearts, and who can become very still and quiet, waiting with their eyes closed. The silent fairy communicated through expressive gestures, guiding them through a journey of discovery of nature’s wonders in the woods – feathers, snails, stones, flowers. She also cried when she saw a tree that was damaged, and the children all gathered to hug the tree and give it love…they also saw her sadness when encountering a pile of plastic bottles thrown in a heap – and gathered them up to bring to the recycling! In fact, in the springtime, recycling became a big theme, and many parents reported that their children had turned into recycling militants that didn’t let them throw away a single piece of plastic in the regular garbage – and when walking in the parks or in town, they passionately insist that any carelessly tossed recyclables on the street or parks must be picked up! We were very proud of the kids! We decided to not only cover recycling as a thematic project, but also have now integrated it into our weekly routine. 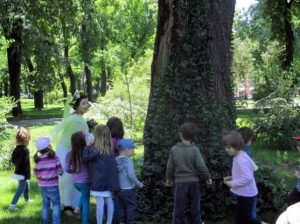 At least once a week, a group of children are selected to wear special “Earth Day Every Day” costumes and carry the recycling to nearby containers. It is always a festive moment for the children and designed to create a lifetime dedication to recycling. We also visited a special project “The Canvas Workshop” which is a work integration project that employs homeless women to sew cloth bags and campaigns for people to use canvas bags rather than disposable plastic ones. The children saw how the bags are made and listened to a talk about what happens when plastic is thrown away into the environment…They also got to paint on some of the bags and we ordered a set with our kindergarten’s logo! During the summer vacation, Alexandra organized a one week summer camp initiative for some of the neighborhood children, most of whom were from a group of Roma families that have little access to such enrichment programs. Every morning the children began the day with yoga and listened to stories in both Romanian and English. They also made masks, had various cooking activities, worked with clay, played lots of games and celebrated at the end with a party! 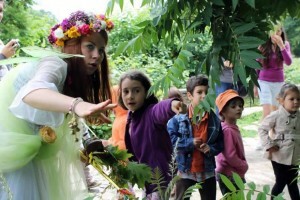 The Neohumanist Education Association of Romania (AEN) organized several trainings – both for the pubic and internally for the Rasarit kindergartens. International author and story teller Susan Perrow led an interactive workshop guiding us through a system for creating personalized therapeutic stories for children, based on the magic of metaphor. Christian Franceschinii from Italy also came and gave a 2 day weekend intensive on Yoga for Children, at the Seeds for Happiness center in Bucharest. In June, Marcus Bussey from Australia, also came and led a “Futures Mirrors” mask-making workshop in the kindergarten. The Neohumanist Education Association of Romania (AEN) submitted the Neohumanist Early Childhood Education Curriculum our team has written to the Ministry of Education in November 2012. However, it has gotten tangled up in a bureaucratic game of ping pong. After several months of waiting for an answer, we tracked down one of the heads of the commission in charge of authorizing educational alternatives, and met with an elegantly evasive man who simply redirected us to another institution which then redirected us back to where we had come from…Though it would appear we have met a stone wall, we have faith that our 3 years of effort will not be in vain, and through our networking contacts, were introduced to one of the ex-ministers of education who will try to help us unknot this blockage. Meanwhile, the Fountain of Hope flourished this year, with 65 children and due to the active and creative involvement of new Romanian and international volunteers. Our Italian EVS volunteers, Beatrice Castella and Francesco Ghilotti led an intercultural exchange program about Italy – dedicating different days to exploring Italian geography, history, art, music and of course food! The event culminated with a Carnavale and the results of the program were made into a slideshow screened during the Open Day event for the community. Meanwhile, Anca and Valentin were an endless source of creativity and energy – introducing the children to many artistic activities as well as sports -from basketball to martial arts and bow and arrow. It was an exciting year for the children – yet even more exciting during the summer – when we launched the 3rd edition of “Club TIP” (The Clever Kids of Panatau) – a program to encourage youth initiative and active citizenship. The children participated in organizing different events, including a children’s festival, disco, film screenings in the open air – as well as community service activities – most notably cooking a hot lunch for the elderly in the village and personally delivering it to their houses. AMURTEL Romania is the first NGO in Romania to introduce a new form of Community Supported Agriculture called “ASAT Social Gardens”. As in other Community Supported Agriculture partnerships, a group of urban consumers form a solidarity partnership with a small rural producer – with the difference being that the rural producer is an NGO rather than a single farmer. 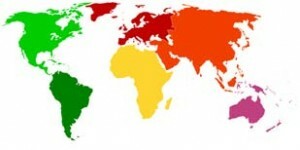 In addition, there is a component of social inclusion, as the objectives of the social garden include providing jobs for those at risk of social exclusion (in AMURTEL’s case, young people that are leaving the care system), and to cultivate fruits and vegetables for AMURTEL’s own social projects. The project has been included as a best practice in the European Grundtvig partnership project “Management of Labor Integration” and was presented in Valladolid, Spain as well as at the “Roma” conference in Liile France. In addition, the project received a prize in the EU- funded Prometheus program for ” Excellence in Business Plans for Sustainable Social Enterprises.”, and it was highlighted on a front page article of the Romanian newspaper “Romania Libera” in July.